My brush with Brando was gratifyingly bizarre. I was helping to run a college cinema club; shortly before one evening showing, there was a phone call: Marlon Brando was in the area filming (news to us), and would he be able to see our film? Was this a hoax? But no, a couple of minutes before kick off a young man appeared who claimed in a stateside accent to be Mister Brando’s fixer. Passing across a slab of notes he explained that the great actor and his party were outside. Only one thing: the lights should go down just before his entrance; Mister Brando preferred to go incognito. Brando (his profile dimly recognisable) and entourage filed in as arranged. They sat in the semi darkness of the front row, speaking little and in low voices, only among themselves. We were showing Kurosawa’s Throne of Blood. 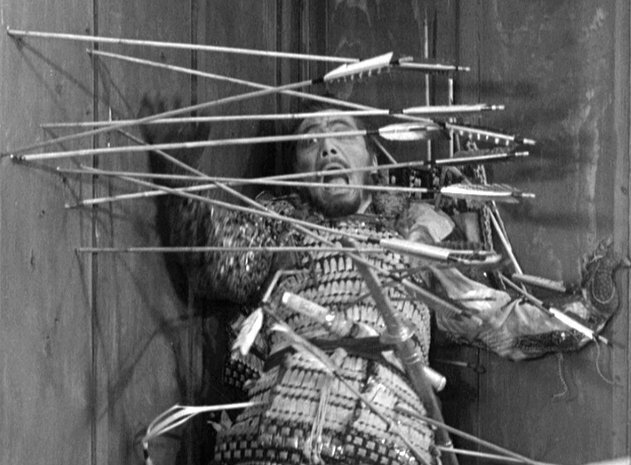 At the end, after Washizu, Toshiro Mifune’s Macbeth character, had undergone his spectacular downfall, punctuated by more arrows than a single human frame might seem able to accommodate, the lights were kept down while they left the same way. Later the college porter told me that on his way out Brando, at the head of the line, had paused before the massy mediaeval oak of the college gate, and had stroked it with his fingertips, in thoughtful veneration. To a man, his entourage had followed suit. The porter had been amused not so much by his original gesture as by their sycophantic mimicry. The great oaken gate had presented itself to him, perhaps, as a signifier of Albion, of ancient wisdom, of a more authentic, pre-American world, a world maybe not too far from feudal Japan. After seven years, Brando was back mumbling in the shadows, this time as the largely invisible Colonel Kurtz on the set of Coppola’s Apocalypse Now. Millions of words later, we are still not much clearer on quite why the filming went so famously pear shaped (as if we care), but in an interview Dennis Hopper has said that Brando’s refusal to be filmed with him came after he had ranted at Brando in a cinema in the Philippines where cast and crew had gone for a night out. Interestingly, from my viewpoint, they had chosen to see Kurosawa’s Seven Samurai, featuring Toshiro Mifune. In early 1922, Eliot had returned to London from a spell under the shrink in Lausanne – “… an aboulie [aboulia, loss of motivation] and emotional derangement” was his self-diagnosis – clutching a wadge of pages for Ezra Pound to hack and snip into something resembling a coherent poem. “The horror” was the first bit into the bin: “I doubt if Conrad is weighty enough to stand the citation,” grumbled Pound. Eliot sniffed back that “It is much the most appropriate I can find, and somewhat elucidative.” “Do as you like about Conrad,” snarled Pound, but the passage was cut anyway. Pound also axed 90% of the original “Death by Water” sequence, leaving few hints of Conrad in the finished Waste Land, though there is still a dripping echo in the sweating river and drifting barges on the turning tide in the “Song of the Thames-daughters” in the “Fire Sermon” section. Both The Waste Land and Apocalypse Now were a mess, a mass bubbled up in chaos and derangement, warping out of control, both requiring merciless chopping down into something the shape of poetry. It seems to me that in this reading Brando strokes the words with his fingertips, in thoughtful veneration. As Anglified American, Eliot has come to represent the man transplanted to the authentic waste land, a discoverer, like the Kurtzes and now like Brando himself, of a far older wisdom, of primal vision. We touch the ancient wood, we feel the immeasurable truth of it, and, with a cry like a whisper, we suspect the horror.